With Chris Brown, French Montana, and a new verse from Meek Mill. Rico Richie debuted a new official remix of "Poppin'" today. 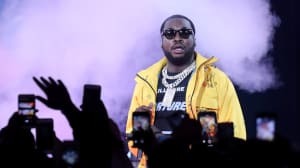 The track originally arrived back in June, but that version only featured four lines from Meek Mill, including the memorable couplet, I'm standin' at a table full of trappers/ I pop a Perc and take off like it's NASA. Now Meek has an entire verse to work with. Don't try to flex for the streets, he warns. Tryna stunt for them hoes will have you broke in a week. Richie's Realest Story Ever Told Vol. 2 arrives next week. Revisit Meek's FADER cover story.